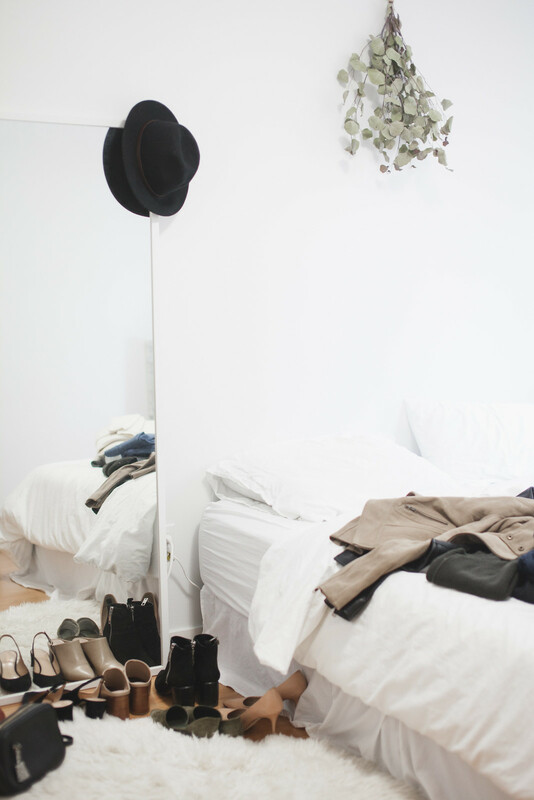 If you’ve been following my blog for the last few years, you may know that it’s been a long-term goal of mine to move toward a smaller closet – one that is growing in selectivity, increasingly more responsible and of a higher quality in general. I started this blog years ago because I loved to shop, but as I’ve learned the impact and consequences of mindless consumerism, both for myself and for the world, I’ve sensed a desire for change. Now, my hope is to try to reconcile what it means to care about how my clothes are made and the impact it has on our planet and on others, while having a high view of creative expression through personal style. It’s been a long, slow process and I’m nowhere close to where I want to be, but here are a few principles and guidelines I have adopted along the way. When I first started this journey of moving toward a more edited closet, I thought I would do one major overhaul and be done with it. I quickly found out I was wrong. I am still constantly evaluating my closet, and each time I do it I realize I have way more than I need. Every half a year — usually at the start of fall and the beginning of summer — I pack away seasonal clothes and do a major overhaul of the ones I’ve taken out of storage. I also have many items that work throughout the year, so this seasonal evaluation is a good opportunity to look at those as well. When I take everything out I’m carefully considering whether or not it will still add value to my closet. The pieces I keep are the ones I’m excited about and know will be worked into many looks through the next half year. I then sell the rest to resale shops or offer them to my girlfriends. Often I’ll consider donation as well: For the past number of years I’ve been giving my gently used clothes to Big Brothers of Greater Vancouver. I appreciate that the pieces are sold to Value Village, which offers inexpensive options to low-income families, and the profit from the sales fund Big Brothers’ mentoring programs. The direct from home pickups definitely also make things easier! 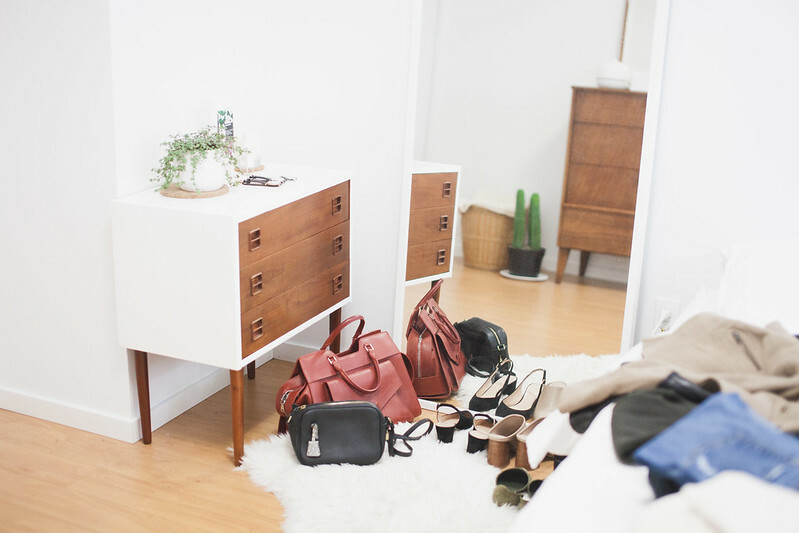 I’m still pretty far from my goal of a thoughtful, edited closet, but I love the idea of moving toward a beautifully curated, minimal wardrobe where each piece is well-loved, well-worn, and nothing is sitting there wasted. One day, I’d like to get there. This is obviously the better option to be kind to the environment – to wear what you already have instead of acquiring more! Truthfully, though, this can sometimes be hard for me because I can still get bored… so one thing I’ve been doing is considering alterations and tailoring. During my seasonal wardrobe edits I’ve often stumbled upon pieces that weren’t great, but with a bit of tweaking gained new life. This season I shortened the hemline of an old trench and created a new belt for it with the extra fabric, taken up a vest that felt a little too long, and I’m currently getting a beautiful vintage coat that I found at a thrift store reworked into something more modern. It’s a relatively small monetary investment for a “new”, updated piece, and it’s a choice that’s kinder to the planet. Also, there’s nothing quite like altering something to fit you perfectly. I’m also taking measures to extend the life of what I own. I regularly get my shoes re-soled so that they last longer. The bottoms are usually what wear out first, and replacing a sole can do wonders for making a pair feel new! Additionally, I love to repair what’s broken. I recently tore a hole in my culottes when I tripped at a wedding (face palm). I thought about replacing them since I loved them, but then decided to first bring them to my tailor the following week. To my delight, because of the placement of the damage she was able to narrow the width of the pants just slightly to close up the hole. The fix was unnoticeable, it cost $10, and it saved my culottes from going into the landfill. The bottom line is: I look at everything I have first and see if it can be reworked and refreshed before springing for something new. I remember the days when I would walk into a store and feel like if I didn’t purchase the item I liked now, I would miss out on it forever. Often I tried to think about whether or not I really wanted something and sure enough, the piece would be gone when I came back for it two weeks later. This led to many an impulse buy and a closet full of clothes I didn’t end up wearing or even like all that much. It was only later that I learned that this is exactly what fast fashion was designed to do – to get you buying, and buying often. 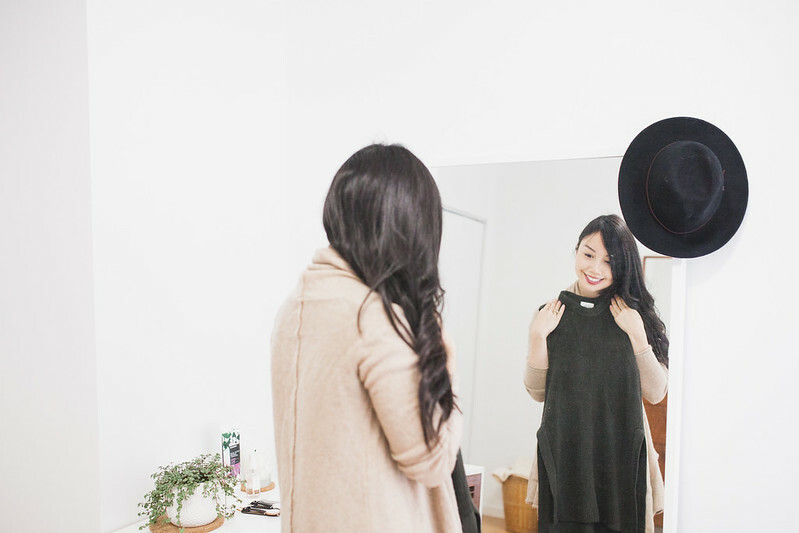 As a response to this, I’ve been trying an alternative method: to keep my shopping, as much as I can, to the beginning of each season, carefully weighing what will be needed and what would strategically refresh my closet. I’ve read that this bi-annual or quarterly shopping thing is what previous generations used to do when clothes were higher in cost and new collections came out just several times a year. I’m also trying to limit my purchases to five pieces in the fall and five in the spring, and maybe a supplementary item or two during the major winter and summer sales. This helps me be selective and ask whether the piece in question is actually worth filling up 1/5 of my ‘quota’ for. Through this, I’ve found that my standards for whether or not I buy something have also become much higher. This fall, I purchased a suede jacket, a large scarf, flat mules, a sweater vest, and a pair of high waisted, dark wash skinnies from a thrift store. As a general rule, I stay with more classic silhouettes and neutrals… or in other words, things that feel like “me”. I do have to disclose that since I’m a style blogger, I occasionally get gifted items of clothing. Right now, I don’t count these towards my five seasonal items. Maybe one day I will. I do, however, heavily limit what I say yes to when it comes to receiving items. As I wrote this post I realized that even just one year ago I likely wouldn’t have done half these things or had this amount of clarity in it. This makes me happy, knowing that it really is a long term journey and every small step means something. I’m grateful to have this place to write about what I’m learning and look forward to sharing more with you and hearing your ideas! Feel free to leave a comment or email me with your own thoughts – I would love to hear them. Can you recommend a tailor and cobbler? I live in Vancouver too but have yet to find a good tailor and cobbler. Maybe you could create a “Vancouver resources” page – having a list or resale/consignment shops and places to donate clothes would be handy too! As a start – It’s been a couple years since I’ve been living in Vancouver. Though by the Safeway on 10th & Sasamat, there’s a cobbler (Varsity Shoe Services) who always did great work and charged fair prices. Thanks Marie! I will check them out. Thanks for the comment Kim! I unfortunately didn’t have a great experience with Varsity Shoe Services – they did a heel tip and it broke off the first time I wore it… when I brought it back they refused to fix it free of charge. Haven’t gone back since, but I’ve loved Progressive Shoe Service on Cambie and 16th! For a tailor, I’ve been seeing Lilianne at Broadway and Manitoba. It’s an inconspicuous store but her work is good and prices are very reasonable. She actually made my wedding dress! Hey Drey! Yes, it definitely is a journey. Sometimes I find myself wanting to buy something that I know won’t necessarily have a long life in my closet just because I want it now. Learning as I go! It’s funny that you think I do because I really don’t keep my things that clean. But I don’t wear my light jackets too often and am always conscious of the weather when wearing both that and suede shoes. I shop seasonally too. I think you have a good style ethic. I don’t shop unless there is something I need. I can’t stand unnecessary consumerism. I’ve been trying to do the same thing, purge my wardrobe aiming for a selection of timeless, long lasting pieces for all year round~ Great tips! I love this post! I think it’s so important to take time and reflect on our goals. 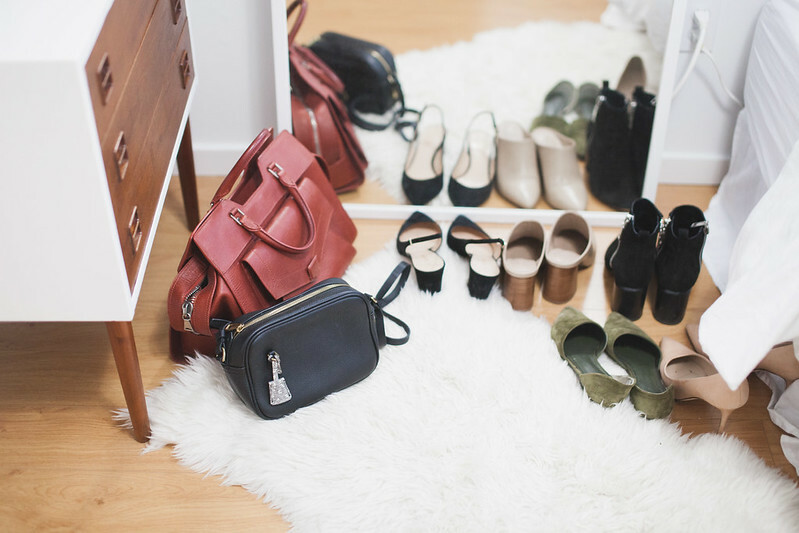 I love where you’re headed with your closet! I love this post. I am going through the same thing and I’m also writing about it. It been a long lengthy process for me. Thanks for sharing your experience. I totally agree on what you wrote about wasting money on too many clothes. But it’s stil kinda sad seeing you not ‘colorful’as you used to be. I loved how you were able to mix the tweet jacket several ways that was totally different and elegant, and the way you wore winter clothes gave me useful fashion tips and change my thought that petite women couldn’t dress nice during winter. I was impressed how you play with yellow, leopard or patterns.I have pictures of those outfits to inspire me. Still, I will support you any way.